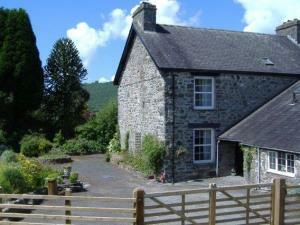 Aberhiriaeth01654 702033work Self-cateringA lovely Welsh traditional stone farmhouse set in its own beautiful gardens. Parts of the house date back to the early 17th century, so there are plenty of oak beams, period fireplaces,cobblestones, slate floors as well as a cosy woodburner in the stunning inglenook. This welcoming farmhouse which sleeps 7 has 4 very large bedrooms, a master bedroom with a luxurious king-size bed, 2 doubles and a single. There is also a nursery with a cot. The large family bathroom has a bath with shower and there is also a W/C and washbasin downstairs. The spacious oak fitted kitchen with its dining area has an oil-fired Aga, microwave and electric cooker as well as an excellent selection of the usual crockery and utensils. The pantry has a fridge and freezer and the washing-machine and tumble drier are in the seperate utility. The kitchen opens to the lounge which has a woodburner in the inglenook and original breadoven is also in place. There is another large and tastefully furnished family lounge with an open fire. Both have colour TV, Freeview and DVD Player. And there is yet another comfortable lounge - for reading! All linen and towels are provided. Heating is provided by storage heaters. Electricity and oil is included in price. 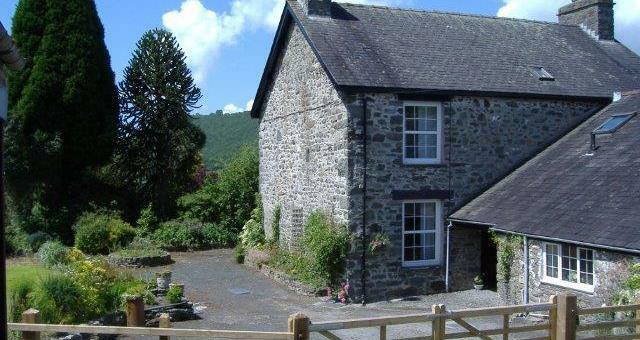 A lovely Welsh traditional stone farmhouse set in its own beautiful gardens. Parts of the house date back to the early 17th century, so there are plenty of oak beams, period fireplaces,cobblestones, slate floors as well as a cosy woodburner in the stunning inglenook. Within easy reach of the sandy beaches of Aberdyfi and the mountains od Snowdonia as well as the varied local attractions.